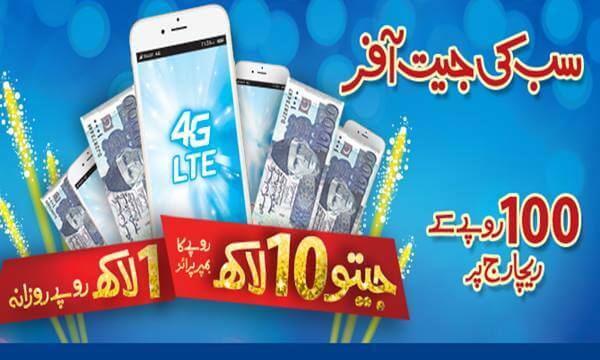 Warid launches an amazing offer for customers with lots of prizes and cash winning facility. This is good news for all the inactive subscribers of this telecommunication now you can win countless prize gifts through lucky draw of this network service. This is such an exceptional and attractive offer has introduced from this telecommunication side for its valued customers. Now all the users of this telecom who didn’t use SIM since last 30 days so this offer has launched for all of them now put back your sim card once again into your mobile phone and take participate on Warid Sab Ki Jeet Offer for winning prizes and cash. All the inactive subscribers can win daily 1 LAC rupees cash prize not only this customers have chance to win an amazing bumper offer of cash 10 LACKS. Subscribers can also win IPHONE 6 smart phone by utilizing that feature. This is not end this telecommunication is providing other multiple gifts wining facility for its customers. This is really big news for all the in-active users of this telecom service because you have chance to win such surprising prizes and bumper deals from re-charging once again your SIM. This service is available only for prepaid customers and they can book place on Sab ki Jeet offer of Warid from recharging inactivate SIM. This is something special and such an exciting deal created from this telecommunication side for customers now there are countless inactive subscribers are putting back once again his/her SIM card to take participate on that amazing feature and try to win prizes. This facility of winning is not only for inactivate users of this telecommunication but all the new buyers of Warid sim card can also take participate on Sab ki jeet offer yes this is such good news for all the mobile users of Pakistan now just can take participate on this phenomenal winning bumper prize deals through purchasing new bio-metric SIM of this network company. This telecommunication has won hearts of many cellular users after providing that wonderful recharge winning package for subscribers. Now there are lot of Pakistanis are attracting to buy SIM card of Warid Glow to take participate on this bumper deal and try to win various prizes, cashes and smart phones through lucky draw. This facility is available all over in Pakistan and all the mobile users of urban and rural areas can easily participate and take a chance to win exceptional bumper offers of this feature. Customers can take participate just re-charge RS 100 on account or buy new SIM of this network service. Subscribers will also receive free resources to use. Users can also avail other Warid call packages or SMS packages with this feature. To get avail free resources of this service just need to dial *277# and press call button. There are no charges to resources subscriptions. Subscribers can avail 100 free calling minutes to avail on same network numbers. Subscribers can enjoy 2000 SMS bundles to use on any local networks of Pakistan. Subscribers can facilitate 200 MBs LTE internet service by using that deal. Customers will utilize only one tariff at a time. They can use only one from calling minutes or SMS buckets or MBs internet. Please note this carefully. Consumers can win daily 1 LAC cash winning from this feature. Consumers have chance to win IPHONE 6. Consumers can win 10 LACS bumper prize from this feature. The winner will be announced through lucky draw.